I'm participating in Boston PHP's PHP Percolate Season 6 virtual learning group to improve my PHP and programming skills. 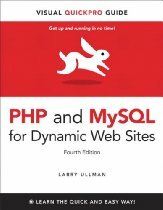 During the next 19 weeks the plan is to complete one chapter of Larry Ullman's "PHP and MySQL for Dynamic Web Sites, 4th Edition" book. Each chapters' exercise files can be found in the overview box to the right. The author's website for the book includes downloads, errata, and other interesting links. Script 8.1 - display_errors.php, PHP file that generates errors. Script 10.1 - view_users.php, Initial script to view users with edit and delete links.